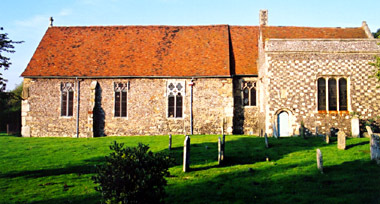 St. Mildred's is the oldest surviving church within walled Canterbury. The dedication is to a Saxon princess who became a nun, dying ca.700. The church may have been built, or rededicated, in the early eleventh century, when St. Augustine's abbey just outside Canterbury was allowed to retrieve Mildred's remains from the sacked nunnery where she was buried. The south wall of the church dates from about that period, incorporating rubble from other buildings, possibly destroyed by a Viking assault on the city in 1011; Roman tiles are also found in the masonry, while the large stones supporting the corner (just visible at left of the photo above) are also believed to be Roman. In the early eleventh century the city was organized into wards (there being no parishes yet) and St. Mildred's may perhaps have served the residents of Worthgate ward, in the southwest section of the city. The ward was not much built up and, within two decades of the Conquest, the Normans constructed a castle on a site adjacent to St. Mildred's. Much of the building was destroyed by a fire in 1246. In 1486 the church underwent an expansion; the section of chequered stone at right of the photo above was one of the additions then. The church also acquired a tower at some point, although this was pulled down in 1836. It remains in regular use today.